Virginia Mennonite Conference | A network of Anabaptist Christians linked by history, theology and geography, with a shared call to Christian faith, evangelism, discipleship, peacemaking and service. Please note that both sessions of the April 5 and 6 “Digging In Together” resourcing event for VMC congregational leaders has been CANCELLED. Contact Anieta McCracken if you have questions. 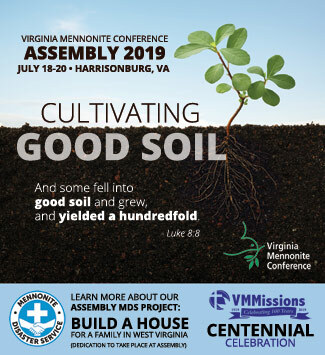 Mark your calendars for Virginia Mennonite Conference Assembly, July 18-20, in Harrisonburg. The theme is "Cultivating Good Soil." Worship services will be at Lindale Mennonite Church; delegate sessions will be at Eastern Mennonite School. There will be a Mennonite Disaster Service house-building project onsite (including dedication), and VMMissions will have their Centennial Celebration. More information and registration to come.